Don't risk playing hide 'n seek out there! I'd visited Allahabad during the Ardh Kumbh Mela in January 2007 and was amazed when I saw the arrangements that had been made. The river Ganga had been reduced to a stream and what looked like an entire civilisation had been made on either side of the river comprising of an infinite amount of tents, about a 100 bridges at the very least and heaps upon heaps of people. What you see above is merely 10 percent of the 'settlement' shot from a permanent road bridge over the Ganga. Each pic of yours is so damn convincing that it makes me want to visit the very scene at tat moment! @Nag: Yup, its not an illusion. @Anchal: Thanks a lot, although a lot of it is due to the location itself. Wow if this was just 10% of it... i can only imagine how big the entire thing might have been. Must have been such an experience to be there at such a time. Great capture! Wonderful colour setting! Rashmi, not to forget, this was just ardh (half) kumbh. 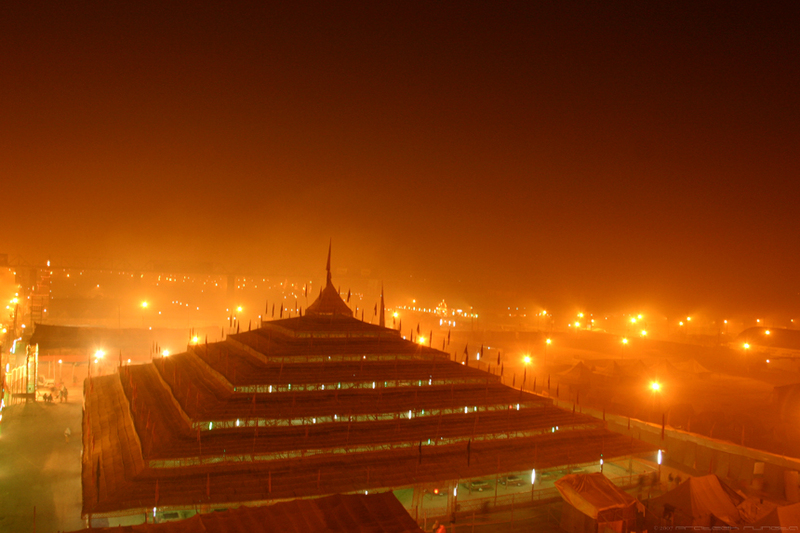 The main kumbh mela will have approximately 10 times the people. If that's not all, imagine how many heaps of people will be there in a kumbh mela that's held once every 100 years! Nag, for you toh they have special tents there...The Nag babas!!! Oh and I think there is no point commenting about the photo, they're always good! @Rashmi: It sure was a 'unique' experience and as Varenya points out, there's more! Lol...although I doubt Rohit Nag knows about the Nag babas. Perhaps photos of 'Nag Babas' would have been nice blog material too! Yes Aditya they would've been, only I reached Allahabad by the end of the Kumb and wasn't able to spot any of them Nag babas. wow... i wonder if it is the camera genius in u or d lights...either way d picture seems to be generating so much of heat !massive balls of fire seem to be erupting around that solemn shelter in focus! Thanks! This one was, as Sonika pointed out, inspired by “Bollywood never [forgetting] to lose brothers and sisters here”.